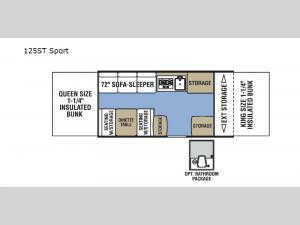 If sleeping on the ground doesn't sound fun anymore, try this Clipper Sport camping trailer on your next adventure. This model is easy to tow and easy to setup. You will be able to get a good night's rest on the king or queen insulated tent bed after hiking, biking, or swimming in the lake. There is a booth dinette and a sleeper sofa for your kids or extra guests, and the cook will enjoy making meals indoors on a rainy day or outside at the exterior LP grill when the sun is shining.